Getting the best results from your Epson printer takes just a few minutes thought and preparation to help you make sure the printer gives you the best possible print every time. Epson recommends that you always use Epson ink and Epson’s recommended paper in your Epson printer. Your printer is designed to use the known characteristics of Epson ink and paper to deliver an optimal print, whether you are printing a letter or a photograph. If you use third party ink or paper the printer is not programmed with their characteristics, so the results will be unpredictable. Epson is also aware from its customer service maintenance records that using third party inks may reduce the normal usable life of certain parts in your printer - see Printer Maintenance advice. Always make sure that you select the paper type in your Epson printer driver to match the type of paper you have loaded in the printer. The printer will precisely place the number and volume of ink droplets required for the type of paper you have told it to expect. A mismatch in paper type will probably reduce the quality of the print, resulting in a waste of ink and paper. Many well known third party companies claim their inkjet printing papers are compatible with all Epson inkjet printers. 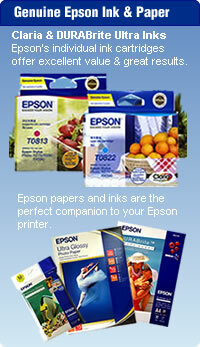 However there are no non-Epson brands of printing papers that are wholly compatible with your Epson printer. Epson has reports from many customers who have used third party paper and have been very disappointed with the results. When the same customers have changed to genuine Epson paper, they have been amazed and pleased with the colour and quality of their prints. Using non-Epson inks and papers is also likely to increase the amount of ink and paper wasted trying to improve print quality. Click here for more information and independent studies on print life and media durability by Wilhelm Research. By design ink cartridges will always have some ink remaining even after the printer indicates that the cartridge can no longer be used. This feature is intended to protect the permanent heads of the printer from going dry, which can cause poor print quality and printer maintenance problems. The amount of remaining ink will vary for many reasons, such as number of cleaning cycles the printer has been through, the types of prints made, the number of times the printer has been switched on or off, and how long it is left on and not operating. Epson generally sells its inks based on the yield from the cartridges rather than the volume of ink in the cartridge, since this is a better indicator of value for customers. and ink usage of your Epson inkjet printer. These recommendations will help you to get the maximum yield and value from your ink cartridges, while maintaining the highest level of image quality output. Exciting new print head technologies including variable drop technology offer users incredible image quality at a variety of resolutions. Generally images printed at lower resolutions use less ink than images printed at higher resolutions. Printer cleaning cycles are a simple and easy way to ensure consistently high quality output. The cleaning process however does use ink that is run through the print head to clear any blockages. Unless your prints are showing signs of a blocked nozzle - missing dots or lines - then it is not necessary to clean the print head. When the printer is on it automatically does a head clean at regular intervals to ensure the nozzles are not blocked by drying ink. If you are using the printer then this is reduced. Like all electro-mechanical equipment your printer has certain parts that have a finite life and will need to be replaced to ensure the printer continues to operate normally and within its safety margins. Epson cannot predict how many years each printer will operate before it requires maintenance, as the life of the parts depends on the frequency and type of printing, the printer environment, and even the type of ink used. Epson is aware from its customer service maintenance records that using non-Epson third party inks may reduce the normal usable life of certain parts in your printer, including the ink pads. To ensure you get the longest possible life from your printer we recommend that you always use Epson ink and paper. The printer control panel on the printer will advise you when a part needs replacing. In most cases the first time this occurs will be when the ink pads need replacing. The ink pads capture the ink that passes through the print head when a head cleaning cycle takes place, and the ink that does not reach the page when borderless prints or CD/DVD printing is selected. Eventually these pads reach a pre-set limit of ink received and need to be replaced. When this point is reached for safety and quality reasons the printer parks the print head in the ‘off’ position to ensure it is protected to minimise the possibility of the ink in the nozzles drying out. Again, for safety and quality reasons, the printer will not operate until the ink pads have been replaced and the ink pad counter re-set. Epson recommends that only an authorised Epson Service Centre replace the ink pads and re-set the counter. Your printer has not been designed to allow a user to undertake this maintenance. Epson is also aware that programs are available on the internet that allow users to re-set the ink pad counter and the printer to be used without the ink pads being replaced. Epson strongly recommends against the use of these programs at all times as the results are not predictable, and especially when the ink pads have not been replaced. In these circumstances the operating safety margin of the printer will be reduced, and the quality of printing may also be reduced. Epson recommends that you take the printer to an authorised Epson Service Centre to have this work done. The job should take a trained technician around half an hour to complete and the replacement parts should cost about $10. If your inkjet printer is some years old you may want to compare the maintenance cost with the cost of a new inkjet printer that is likely to have improved performance, such as faster print speeds, and additional features, such as CD/DVD printing. You can view Epson’s current printer range and recommended retail prices here. You may like to purchase a new printer through Club Epson where special promotions and cash back offers may reduce the purchase price of your desired printer, and to register for the Epson Genuine Rewards program that rewards you for purchases of genuine Epson ink cartridges. If you choose to have your current printer serviced you can rest assured it will continue to provide you with the same high quality prints and operational reliability as it has since you first purchased it.